I saw a similar DIY project in Martha Stewart a few months back and planned on creating these inexpensive vases, but never got around to it. Now, after finding a similar post on apartmenttherapy.com, I think it is about time to complete this project! 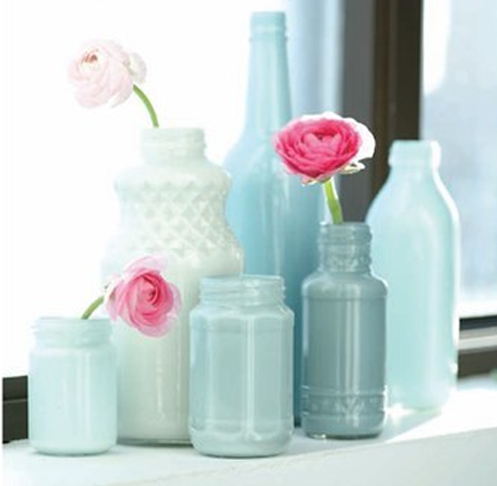 Check out the simple directions below to add paint to the interior of any glass bottle and create unique, one-of-a-kind vases. Martha also suggests getting colored glass and using white paint to accentuate the tinted glass. How easy is this? After finding some bottles with great shape and detail, remove the labels, clean the inside and let them dry out completely. Next, pour a good size dollop of paint into the bottom of the bottle. The color options here are endless. This set is monochromatic, but a few bold contrasting pieces would be quite nice as well.